The D'Luca 400 Series flute meets and exceeds school standards providing great intonation, comfort, and mechanical reliability. Purple 16 Closed Hole Flute in the Key of C with Offset G and Split E Mechanism. Each D'Luca flute is quality inspected in Los Angeles distribution center to ensure that their high quality standards are met. Buy with confidence, this flute includes 1 Year D'Luca Limited Manufacturer Warranty. 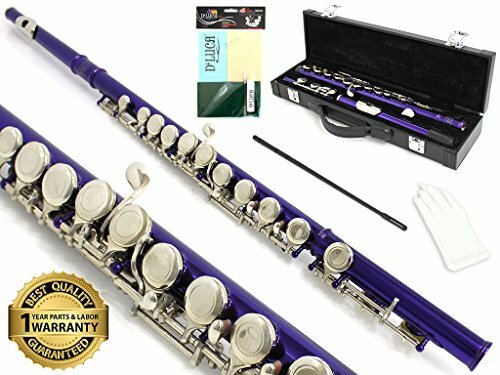 The D'Luca Purple 400 Series flute meets and exceeds school standards providing great intonation, comfort, and mechanical reliability. This Beginner-intermediate flute is in the key of C; it's made of Cupronickel and features 16 plateau keys, commonly known as closed hole keys, which make the flute easier to play. The Offset G provides a natural hand position allowing you to reach the G key with less strain on the hand and eliminate potential problems that can be encountered with inline flutes. The Split E mechanism divides the action of the upper and lower G keys allowing more versatility and improve the response. Each D’Luca flute is quality inspected in Los Angeles distribution center to ensure that their high quality standards are met.